If there’s one thing I am a sucker for, it’s bold feminist outcries. 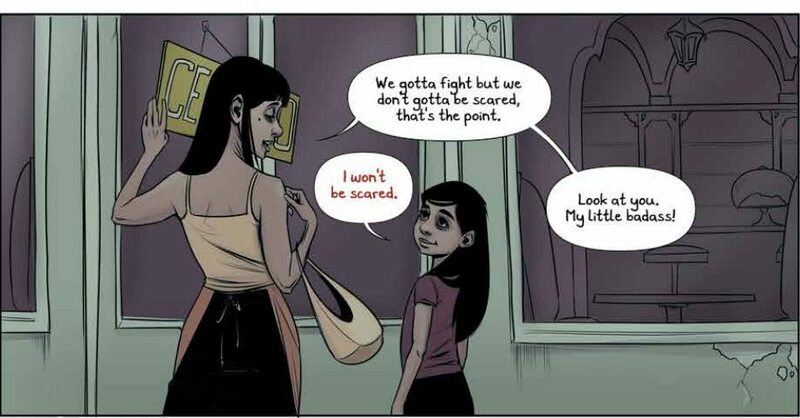 And when I find such an outcry in comic form, fierce women of color and a compelling story are the cherries on top. 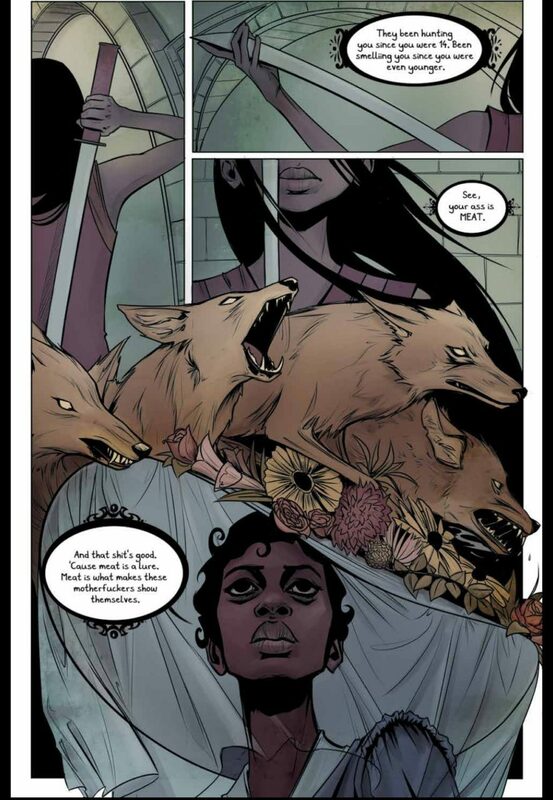 With all of the absurd controversy—not only in the comics universe, but in the real world—regarding inclusion and diversity, Image’s Coyotes by Sean Lewis and Caitlyn Yarsky is the dark, beautiful kick in the teeth the comic world needs right now. Lewis brings us into the City of Lost Girls through Analia, a young woman of color with a very real story to tell: a story of women, girls, and the wolves they protect each other from. While wolves themselves are scary enough in reality, the story is cemented by turning them into a familiar adversary for women of today. Though the City of Lost Girls is made up of lively, strong, and fierce women ready to fight, threats are always on the horizon. 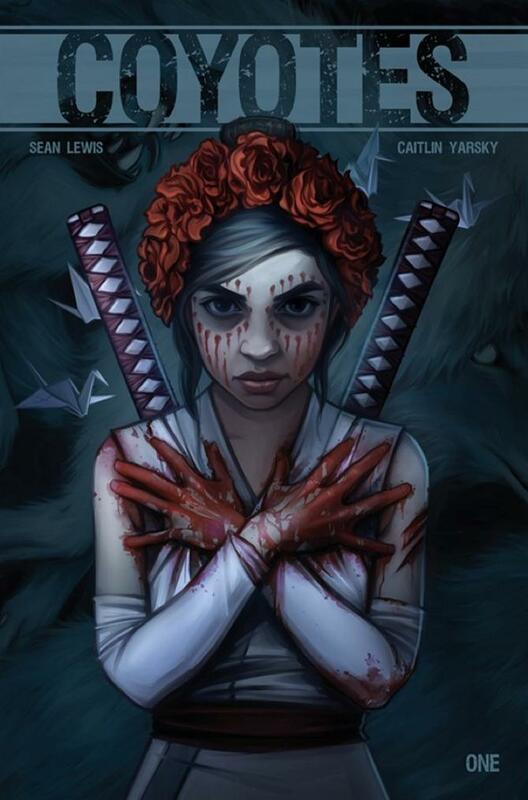 With the disappearances of young girls being a major issue in the real world, this comic addresses it in a way that is both disturbing and poetic, going so far as to have one of the more mysterious characters, The Dutchess, describe the threat of wolves to Analia the way only someone who fights but has no fear can, and in a way that many women will find very familiar. While the first issue packs a lot of characters, storyline, and aggressive topics into so few pages, it does not come off jumbled or overcrowded. The story and characters flow easily thanks to the beautiful detailed artwork by artist Caitlyn Yarsky. Even the smallest details, from curling cigarette smoke and the ruffles of intricate dresses to large, sprawling multi-panel fights are made more beautiful by the rich and striking colors. 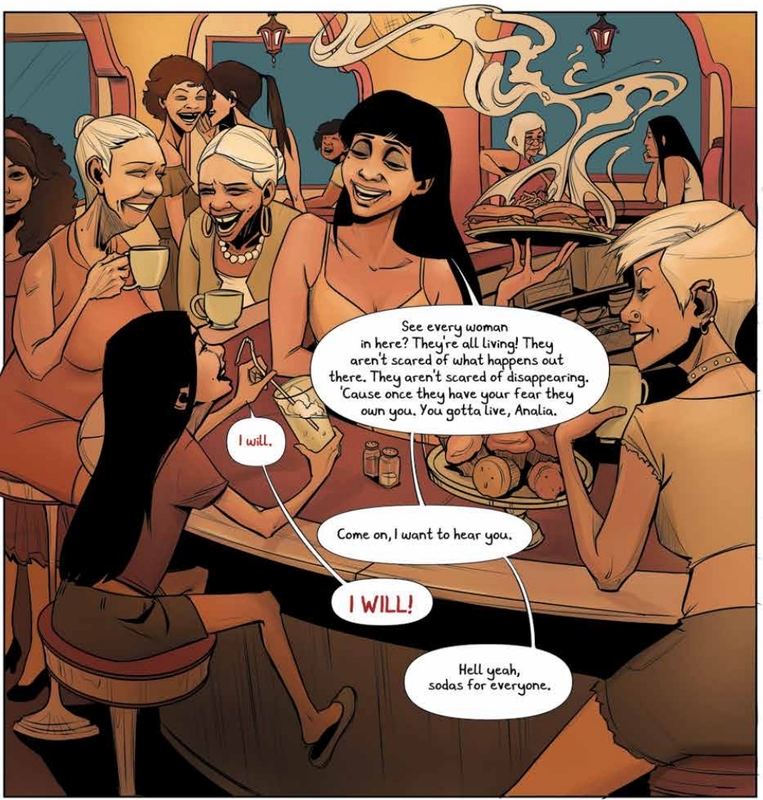 The contrast between the main character’s personal feelings and warmth of her community are gentle against the raw determination that comes out in the colors of each page while not seeming stark or harsh, but natural and emotionally-driven. There is also something to be said for Sean Lewis’s ability to bring so much real life struggle to the story while keeping the whimsical hopefulness that comes from the characters. Because Coyotes immerses itself so deeply into Mexican culture, to see the unedited use of Mexican tradition and customs such as dialog in untranslated Spanish and traditional face paint was a breath of fresh air. 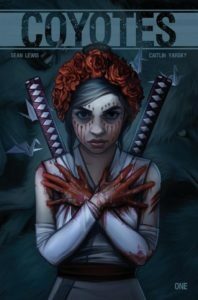 With those traditions such a heavy influence on the artwork and dark fairy tale storytelling, the focus was brought directly to the horrors that women and young girls face while still sticking to the hope and fight-back mentality that comes with being a woman of a minority culture. I would be wrong to say say that Lewis and Yarsky’s Coyotes isn’t a dark tale. But with that darkness comes a great strength that—for me—was eye opening. As multi-faceted as the story may be in just one issue there is a smoothness to the narrative that made me not want it to end. I personally cannot wait to see the rest of the series push the storybook atmosphere further within reality. It will definitely be a fight anthem story for strong women everywhere.